Colorado Public Radio (CPR) News is on a roll. CPR’s recent investments in news capacity are paying off with record-high ratings and increased impact within key sectors of the state. And, as a rock DJ once said, The hits just keep on coming! Earlier this week CPR announced it has received a $300,000 gift from an anonymous donor that is earmarked for an Investigative reporting team. 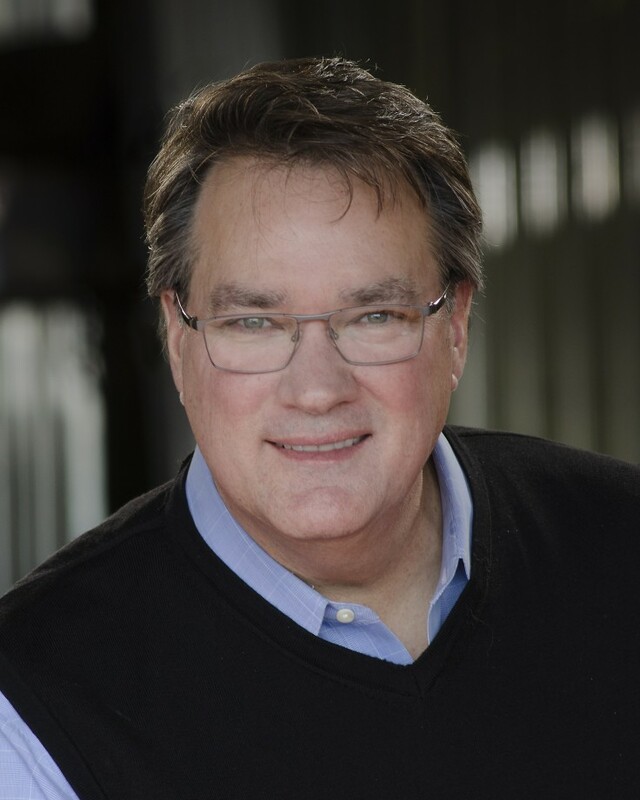 The gift means that CPR News can add an investigative reporter to lead the new unit. Soon CPR News will add three full-time investigative reporters, a data specialist and an investigative editor to the team. “Investigative reporting is the product of giving skilled journalists the time they need to dig into important subjects." It also further advances CPR goal of being Colorado’s “news of record.” The state’s leading newspaper, The Denver Post, has fallen on tough times because of a change in owners and a challenging media environment. Listeners are noticing the excitement at CPR. 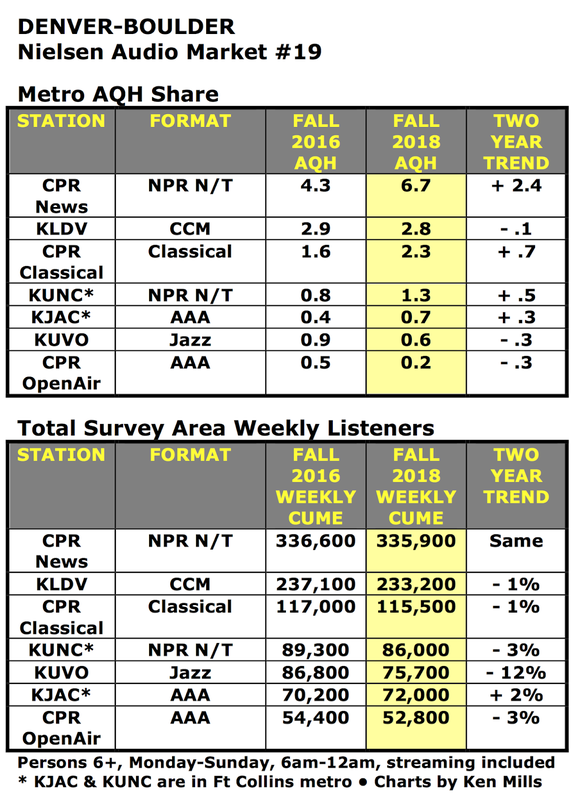 In the Fall 2018 Nielsen PPM ratings, flagship CPR News station KCFR had an AQH share of 6.7%, believed to be the highest share CPR News has achieved. It is also a major increase in AQH share compared to the PPM ratings for Fall 2016. That was the Trump Bump election. Elsewhere in the Denver-Boulder market CPR’s Classical music channel also in creased it's AQH share compared to Fall 2016. Fort Collins-Greeley based AAA music station KJAC The Colorado Sound increased both its AQH share and estimated weekly listeners. Not that long ago CPR News announced it was building its out-state capacity by hiring reporters to be based in Colorado Springs and Grand Junction. CPR News upgraded their overage of the Springs when they debuted, with great fanfare, a new full-power FM repeater at 102.1 FM. It signed on June 23, 2017. As you can see on the coverage map on the right, CPR’s Springs voice covers the city like a blanket. 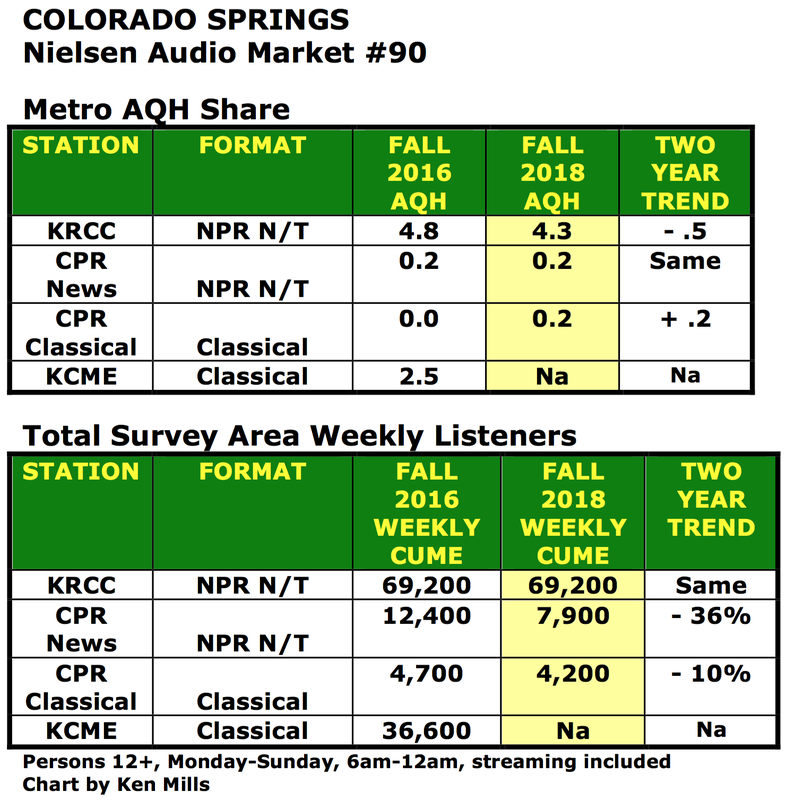 But, even with the new local station, the ratings for CPR News in the Springs went down. 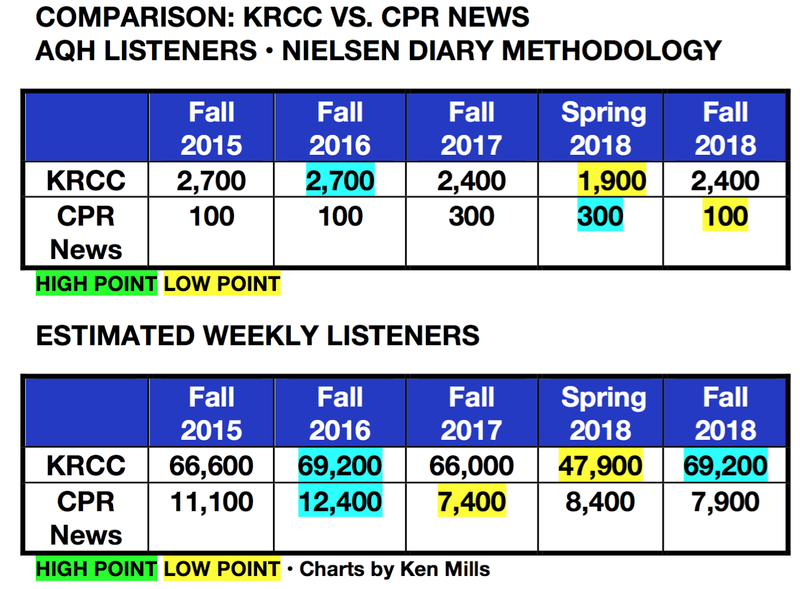 On the left is a three-year comparison of AQH shares and estimated weekly listeners for KRCC and CPR News. In the Nielsen Diary ratings, the contest between KRCC and CPR News isn’t even close. 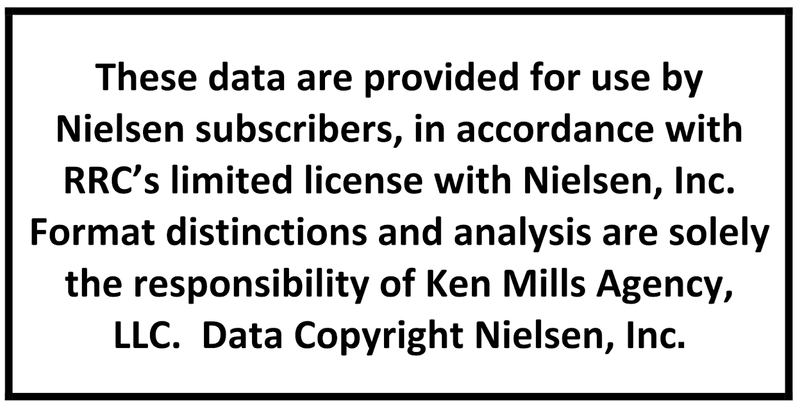 CPR News hasn’t put a dent in KRCC’s ratings. 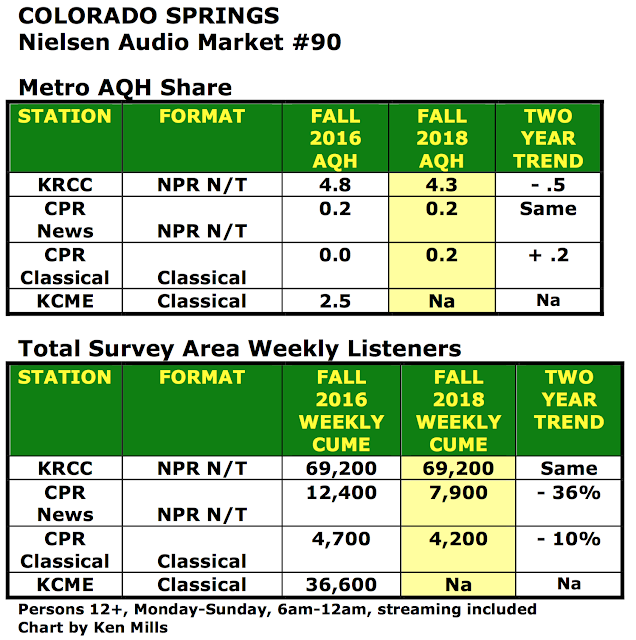 On the left is a chart showing the Fall 2018 ratings for noncom stations in Colorado Springs. Even though KRCC’s AQH share dipped a bit compared to Fall 2016, CPR News is hardly a factor in the market. Credit former KRCC GM/PD Tammy Terwelp (now GM at Aspen Public Radio) and the crew at KRCC for making KRCC essential listening in Southern Colorado. Earlier this week we featured the results of the first iHeartRadio podcast awards. We challenged the veracity of the awards for several reasons. One was iHeart’s choice of conservative talker Ben Shapiro’s show as the Best News Podcast over actual news programs such as The Daily. Now Ben Shapiro is showing his true colors. Last Friday (1/17) he lost two of his podcast’s advertisers due his odd anti-abortion rant the previous day. In his rambling commentary, Shapiro explored the philosophical dilemma of Would you kill “baby Hitler,” if you could? 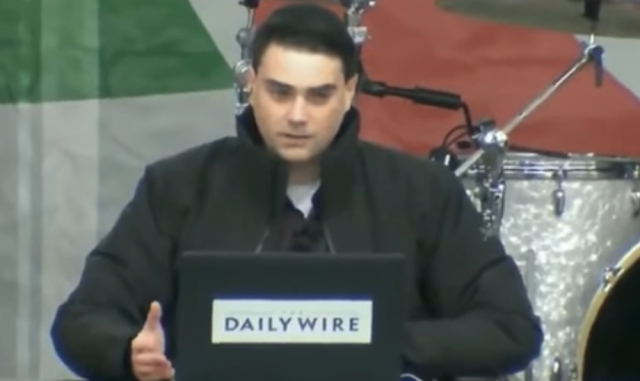 I am going to stand up and comment on what Ben Shapiro said. Taken out of context as always by the progressive mob. It seems that someone used the argument that if you know that someone would do great evil and had the ability to time travel, what if you go back into time and make sure that Hitler's mother had an abortion or kill Hitler as a baby if already born. It was another justification to make the argument to "keep abortion legal." Ben compared this thinking to the science fiction movie (and failed TV series) Minority Report (started out as a short story in 1956). The goal would be to move Hitler as a child to a healthier environment or he must be taken out...do it when he is older preferable when he is a legal adult. This is no different than the boys from Covington Catholic High school and them taking in the sounds of Nathan Phillips, and don't forget the Black Israelites in the mix before Phillips stepped into the picture. I should note that Shaprio is Jewish himself and does practice his faith in an Orthodox Jewish body. He along with Dennis Prager, Michael Medved, and Mark Levin are Jews who happen to be Conservatives and not going along with the popular culture (New York or Hollywood) Jews like Norman Lear who really don't practice the Jewish faith but rather embrace a progressive worldview.